Since 2013, a conspicuous number of water main breaks and sinkholes have been reported across the U.S. While water lines commonly rupture during winter months, especially in regions experiencing subfreezing temperatures, large water mains are fracturing in southern states where ground temperatures remain above freezing. Harrisburg officials expect it will take several weeks to repair damage from a massive sinkhole that forced dozens of residents to evacuate. The city’s Department of Public Works said it could be another 30 days before water, sewer and gas lines are replaced in the neighborhood where the sinkhole is causing problems. "Super Sinkhole Walter," as the North Fourth Street collapse has been called, is big enough to have its own Foursquare check-in location. On Thursday, the massive hole partially swallowed a construction backhoe. The hole opened Monday morning, and later opened a bigger hole. A spokesman for Mayor Linda Thompson said the city must replace the entire water and sewer system lines on the block. The spokesman, Robert Philbin, said new water and sewer lines will not be working for five to six weeks. These two large sinkholes in the 2100 block of North Fourth Street are among at least 40 sinkholes covered by steel plates citywide, according to Kevin Hagerich, director of the city’s Department of Public Works. Another water main break in Malibu collapsed part of John Tyler Drive as crews worked to repair the leak. A broken water main and partially collapsed road have narrowed traffic to one lane on Malibu Country Drive near John Tyler Drive. Between 30 and 35 customers in Malibu Country Estates are without water. Los Angeles County Public Works received a call about a partially collapsed roadway on Malibu Country Drive at 9:30 a.m, according to spokesman Mike Kaspar. Kaspar said the road is cut down to one lane for approximately 100 yards. This is the second water main break reported in Malibu in as many days. On Wednesday, the main that supplies water to the Adamson House broke and employees from Public Works worked overnight on a temporary fix and permanent reroute of the underground pipeline. Westbound traffic on Pacific Coast Highway was cut down to one lane between Malibu Inn and Serra Road while crews made the repair. A broken valve is causing complications in repairing the break in a 16-inch water main and the road may be closed until Saturday, authorities now say. The valve, which broke in a partially-closed position, must be replaced before the water main can be fixed, Wyoming Director of Public Works William Dooley said in a statement on Friday, Jan. 4. The water main broke area of 44th Street SW and Clay Avenue on Thursday. The westbound lanes of 44th Street are closed near Clay Avenue, and Clay is closed from 44th Street north to Louisiana Avenue. Dooley said the repair is taking much longer than anticipated because of the valve problem. Water is still flowing from the main because the valve cannot be closed. A private contractor has been called to help city crews and they expect to fix the valve this afternoon. Dooley said the water main break has not affected drinking water to area residents. “Once the valve has been replaced, we will start work to repair the water main and hope to have that wrapped up yet today. We recognize and apologize for the inconvenience that this has caused to businesses, area residents and motorists and are working as quickly as we can to return things to normal," Dooley said in the statement. A water main break in the middle of Adams Street near Maple poured water into the streets Friday afternoon. Sewerage and Water Board crews arrived on the scene around 1:30 pm to address the incident. An hour or so later, the break erupted into a full-blown geyser, showering Adams Street with water. Water was rising on the sides of the street near several Uptown businesses, creeping up on the tires of some cars. A massive water main break caused headaches for both residents and drivers on Clairmont Road in Chamblee, more than 24 hours after it first happened. A huge hole opened up in the road between Airport Road and Wingate Road Saturday morning. Residents in the area were without water for much of the weekend after the 30-inch water main break. DeKalb County spokesman Burke Brennan told Channel 2 Action News that they first had to clear out the water from the hole to determine the cause before they could begin repairing it. Major damage to the road and the sidewalk could still be seen well into Sunday morning. Brennan says the pipe's age could have been a factor in the break. Police were on the scene to re-direct traffic away from the area near DeKalb-Peachtree Airport. A 16-inch water main broke Saturday morning, turning two streets into ponds and damaging several homes along 39th and D Streets. The Pittsburgh Water and Sewer Authority says that a 30-inch line broke in the Oakland/Bloomfield area near the South Millvale Bridge at Morewood Street. Two Port Authority stations and a portion of bus routes were closed after the water main break. The break happened in North Oakland around 6 a.m. and the Neville Ramp, Herron and Negley Port Authority stations were closed as a result, our news partners at the Pittsburgh Post-Gazette report. The East Liberty station is as far as inbound buses can go and outbound buses will make it to the 26th Street Ramp, the Post-Gazette says. Officials said the water main break exposed a 24-inch Equitable gas line. PWSA officials said that all efforts are being focused on the gas line. A large water main break on Sunday caused the closure of State Route 20 in Port Townsend near the ferry terminal. Around 3 a.m., Police and Public Works responded to the 1800 block of Water Street where the break was reported near the Tides Inn and Suites. Portions of State Route 20 pavement were raised several inches above the original road bed as pressure from the water pushed up to the surface. When crews first arrived on scene they found water running west down the road. At least one business, The Food Co-op, 414 Kearney Street, had flood damage as water rushed into the building. The closure affects commuters traveling to the Port Townsend-Coupeville ferry route. Detour routes for ferry traffic have been set up through city streets. Water to at least a dozen businesses and residents was shut off but was restored by 3:30 p.m. The Department of Transportation will not have materials available to begin repairing the highway until sometime Monday, according to Claudia Bingham Baker, WSDOT communications manager. Detours will remain in place until crews determine the road is safe to reopen, which would occur Monday at the earliest. The cause of the break is under investigation. LYCOMING COUNTY — The water is back on after a pipe burst Saturday in part of Lycoming County. Water gushed from the water main in this video courtesy of the Williamsport Sun Gazette. The break happened yesterday afternoon just outside the city on Four Mile Drive in Loyalsock Township. Crews fixed the break last evening and folks in that area are being asked to boil their water until Tuesday. Newswatch 16 spoke to one woman who described what she saw when the main spewed all that water near her home. “It was a very very loud noise, sounded like a train was coming through actually and the water was shooting way above the trees. It’s kind of a pain to have to boil your water but we’ll deal with it,” said Valerie Gardner, Loyalsock Township. No word what caused the main break. Water officials could not say how many home and businesses were affected in Lycoming County. A water main break early Sunday morning in a Southcrest neighborhood left 28 customers without water. Residents first called police just before 3 a.m. on the 3000 block of Boston Avenue. San Diego city water crews worked to repair the eight inch main break. Six people had to be evacuated after mud filled the front of their homes. City engineers were on the scene for hours trying to determine what caused the break. The leak was expected to be restored at 1 p.m.
UPPER ST. CLAIR, Pa —At least 75 customers were without water Tuesday night after a water main broke in Upper St. Clair. A spokesman for Pennsylvania American Water Company says a 12-inch cast iron pipe broke near the intersection of McMurray Road and Route 19. Water gushed out of the road but flowed almost entirely into a creek, so no homes were damaged. Upper St. Clair High School, which is directly across the street from the break, was not affected, but St. Clair Country Club did lose water service. The club posted a sign on its door apologizing for the inconvenience to its patrons. Pennsylvania American has had to deal with at least six water main breaks in the past week, including messes in Baldwin, Carnegie, Munhall, and Pleasant Hills. A company spokesman said it doesn't appear the incidents are related, but the company will look into whether there is any connection. Many of the pipes are believed to have been several decades old. Pennsylvania American expects to have the water back on for customers in Upper St. Clair by early morning Wednesday. A water main break Monday morning caused damage and left many without service in Pittsburgh's Overbrook neighborhood. The break in a 30-inch line along Homehurst Avenue was reported shortly before 9 a.m.
Are you on Regina's map of 1,100 water main breaks? When it comes to water main breaks in Regina, 2015 has been a very good year. Over the half decade, not so good, however. 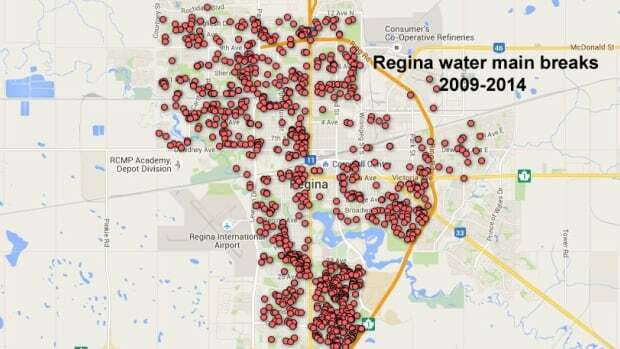 CBC News has mapped every water main break in Regina between the beginning of 2009 and the end of 2014. That's 1,104 busted pipes. With red dots for every break, the result is a city that looks like it has a bad case of the measles. Virtually every corner of the city that's more than a few years old has experienced water main breaks. Each time it happens, a city crew comes out to start digging and make repairs. A few brand new neighbourhoods like Harbour Landing have been immune from the breaks, but everywhere else there's a sprinkling of red dots. There appears to be a a slightly concentrated number of water main break problems in the city's south end, and relatively low numbers in the northeast. The bottom line is, there's really no discernible pattern that would allow the city to know where the next batch of breaks will happen, says Pat Wilson, the city's director of waterworks. The good news is 2015 is turning out to be one of the better years. "Actually, we have been having a very, very low year for water main breaks," Wilson said. Typically, there are 65 water main breaks in the first half of the year, she said. However, so far there have only been 19 to the end of June. The worst years are when there's an especially dry summer or an especially cold winter. The heavy rain late last month is a good sign that the number of breaks could remain relatively low, she said. However, if there's more dry, hot weather, that could change. A burst water main floods part of Hardy St in Nelson. A burst water main which temporarily affected water supply to central Nelson businesses has been repaired. A water main outside Kuske eyewear and Eclectic Antique Centre on Hardy St burst around 1.30pm on Saturday afternoon, flooding the road and causing water discolouration for surrounding businesses. Water supply in the central city was cut off as a section of the road and footpath was dug up by Nelmac workers to repair the pipe. The repair was completed with water back on by 7.00pm Saturday evening. Some repair work to the foot path and the road was now required as a temporary asphalt patch was used. The Nelson City Council said they had not yet determined the cause of the split water pipe. Despite a water tanker providing shop owners with water for the duration of the repairs, some businesses were forced to close as their water ran brown from taps. Nearby business Morrison Street Cafe had closed early for the afternoon after the main burst. "There was just a big gush of water and the footpath had sunk, water was gushing out," said Morrison Street Cafe manager Dee Toma. Fords restaurant owner Kerry Ford said despite the water supply being cut in the afternoon, it was business as usual for the restaurant on Saturday evening. "We just waited about an hour... it didn't affect business," she said. MADISON, Wis. (AP) — About 300 residents had to evacuate an apartment complex in Madison, Wisconsin, after a water pipe broke, creating a sinkhole that swallowed three vehicles. Madison Fire Department spokeswoman Cynthia Schuster says emergency personnel were called to the River’s Edge Apartments shortly before 5 a.m. Friday. Rajendra Aryal’s Honda Civic was among the three vehicles that fell into the water-filled sinkhole. Aryal, a native of Nepal who’s still learning English, tells the Wisconsin State Journal (http://bit.ly/1PcNeGb ) he had never heard the word “sinkhole” before it happened. While residents had to evacuate four buildings due to initial concerns about a gas leak, that danger was later ruled out. However, two buildings still had no electricity or water Friday afternoon. Officials say those residents will likely need to spend the night elsewhere. COLORADO SPRINGS, CO- Water main break partially blocking N. Circle Dr.
SOMERSET, PA- Water Main Break Along N. Center Ave.
A road has been closed in Melbourne's south-east after three lanes caved in due to a burst water pipe. 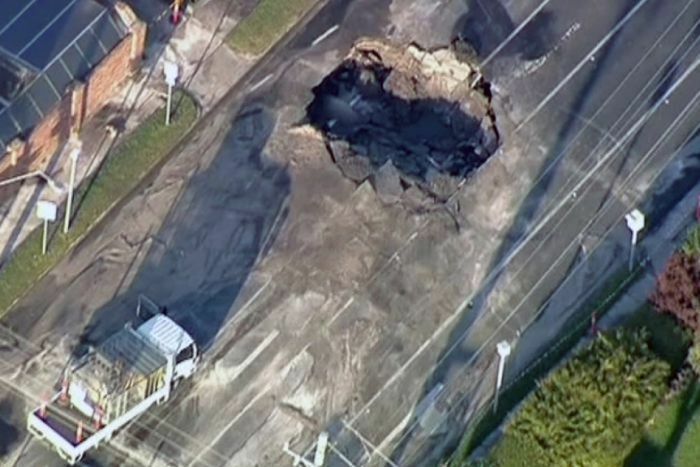 The incident took place around 2:00am (AEST) on Tuesday, causing a huge hole on Glen Eira Road in Caulfield. South East Water said the hole was not a sinkhole as it was caused by the burst pipe. "Crews were onsite in the early hours of this morning to respond to the burst main," South East Water said in a statement. "The burst has caused damage to the roadway, as such the road is closed between Kooyong Road and Orrong Road. "Crews are working to reinstate the road as quickly as possible." Water supply has been restored to the area. The burst pipe caused damage to the roadway, with the road between Kooyong Road and Orrong Road closed and traffic being diverted. Impressive water main geyser near San Diego today. Oct 10,2015 JACKSON, Miss. —Jackson is dealing with a rash of over 20 water main breaks this weekend, according to the city's director of communications, Shelia Byrd. Crews have been working throughout the weekend and will continue to make repairs on a priority basis, Byrd said. The breaks affecting the highest number of residents will be given top priority, she said. Residents may see low pressure until crews fix the issue, officials said. Residents are encouraged to call the city's action line, 311, to report a break. Byrd said a fluctuation in temperatures and other factors may have lead to an increase in the breaks. Below is a list of current breaks as of 6 p.m. Saturday. For the second time in two weeks, a water main broke on Grassy Key Thursday morning, lowering water pressure for homes and businesses north and south of mile marker 59. "Valves are being shut down to the north and south," said Tom Walker, engineering deputy director of the Florida Keys Aqueduct Authority. "Probably people closest to the leak will have low flow, very low pressure. When we shut the valves down, there will be people there who won't have water." He said he expects water pressure to be back to normal by 5 or 6 p.m.
"Since it's right in the same vicinity of the last leak .... there had been corrosion on the bottom of the barrel of the pipe. The wall thickness thinned out to the point where it finally broke. This may turn into an area where we have to do pipe replacement." He added, "About five years ago we had a leak in that area but nothing subsequent until two weeks ago." On Sept. 25, a sinkhole developed in the same area and customers lost water pressure due to a pipe break. The FKAA was also dealing with a small leak on 109th Street in Marathon. "It's an air release valve. For whatever reason, a bonnet came off. Instead of letting air out, it's letting water out," Walker said. "Somebody saw some water coming out of the valve." Additionally, there was a leak on a pipe on State Road 905 in North Key Largo Wednesday night. Walker said that was localized and affected few people. We looked into yet another unexpected water and sewer main break. This one is in a busy north Jackson neighborhood and residents there are under a boil water notice for the second day. The problem erupted at the busy intersection of Northside Drive and Ridgewood Road in north Jackson. Area residents say it began leaking Thursday. Friday morning, the street began crumbling from within. A geyser erupted when water and sewer lines broke. Crews from the City of Jackson arrived quickly to try and minimize the damage. Nandy's Candy took it all in stride. "We came in at 10 a.m. and were told we were under a boil water notice. It was lifted but then it's come back again. That's how it goes." said Emmie King Friday. Other businesses in the area are expressing frustration. Jeff Good, owner of Broad Street Grocery said they had to close temporarily Thursday. He said this is the sixth time they've had a water episode in the past 10 months. Good called it a full on crisis. St. Richards had children bring bottled water to school today, and Starbucks in Maywood Mart had a closed sign on the front door. Utility crews Thursday worked to repair 4 water main breaks in the Silver Lake and Mar Vista areas that left about 100 customers without service and caused a sinkhole in one neighborhood. At 2:15 a.m., an 8-inch main break was reported in the 2400 block of Glendale Boulevard in the Silver Lake area, Los Angeles Department of Water and Power spokeswoman Gale Harris said. At 3:15 a.m., a 4-inch main break was reported in the 3900 block of Moore Street in the Mar Vista area, the LADWP reported. In the second break, some debris propelled by the high-pressure water damaged several nearby vehicles, an LADWP representative said. A sinkhole several feet deep also developed around the broken pipe. It was not immediately known when there would be complete water restoration to the affected areas. 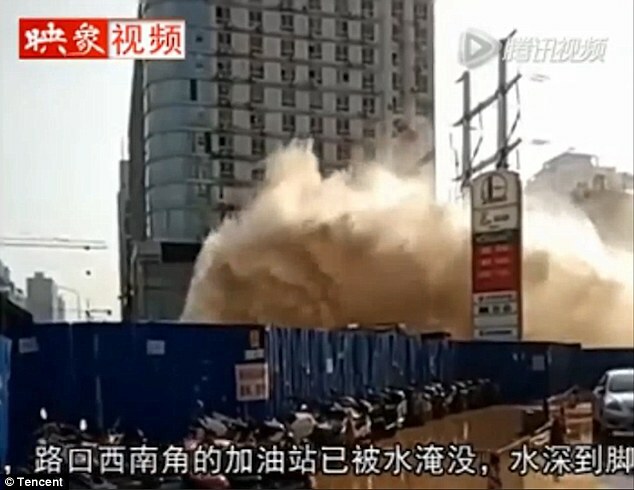 FORT WAYNE, IN- Water main break repaired on Spy Run Ave.
LOUISVILLE, KY- Water main break impacts dozens on Northumberland Dr.
A video has emerged online showing a burst pipe launching tonnes of water into the air at a three-way intersection in Zhengzhou city, central China's Henan Province. The accident happened last month near a construction site. 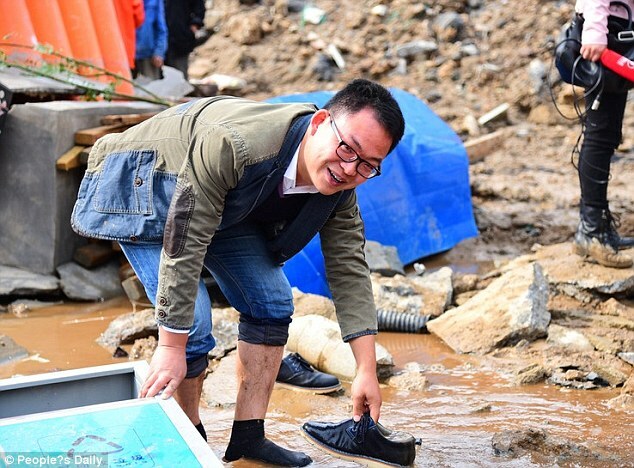 Witnesses said the flow of water was as strong as a tsunami which left many bare-footed pedestrians were fleeing for their lives, reports The People’s Daily Online. When the pipe burst, the water flew 30 feet high, hitting high-voltage electricity lines above. And below, a fast flowing river instantly formed on the road, holding up the traffic. 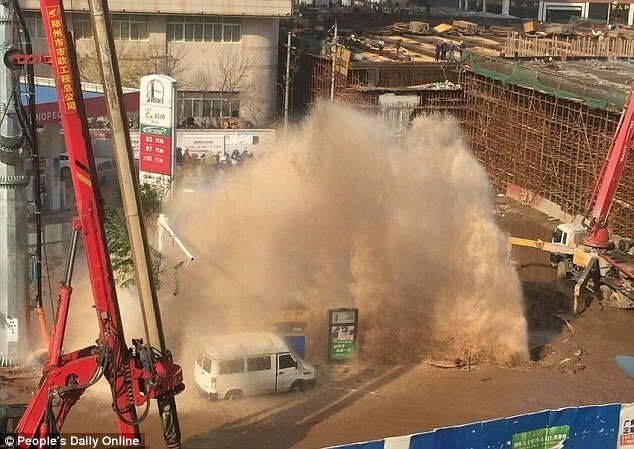 An official from the Zhengzhou Municipal Corporation said the pipe burst at 8am on October 29. In the 50-second amateur video filmed from a building above, the water can be seen gushing into the air from a small road. It goes so high, way beyond the rooftops. Some people can be seen standing nearby away from danger. It’s a miracle no one was harmed at the time the pipe burst. The whole area around the damaged pipe was affected, water was spewing out for an hour before engineers managed to stop the flow. HOBOKEN, NJ- Two water mains flood Hoboken – What’s next? The sinkhole on North Holtzclaw was apparently caused by an underground water main break, according to a Chattanooga public works employee. Tennessee American Water has been notified and has crews on the scene. The workers must first turn off the water to that main, drain the water from the hole and then dig around it to determine if it is indeed a water main break. The hole opened up Tuesday morning in the 600 block of North Holtzclaw Avenue. The hole damaged several vehicles that apparently didn’t see it in time, flattening tires and damaging wheels. "You didn't know what you were getting into until you fell into the hole," said Tina Morgan who hit it driving to work. " Just thought it was a puddle and then BAM. Our tires busted, the rims busted." The hole, which filled with water from the recent heavy rains, was hidden and looked much like a puddle. "There were cars beside me so I couldn't swerve to get out of the way, I had to go through it," said Daniel Kilts, another affected driver. "You couldn't see anything cause the water was so smooth." City road crews were able to mark the hole with barricades to prevent additional vehicle damage. Motorists are advised to seek an alternate route if possible. SAN DIEGO, CA- Crews respond to water main break on Morena Blvd. JACKSONVILLE, FL- Water main break repaired at Roosevelt Blvd. and McDuff Ave.
MUNSTER, IN- Water main break closes part of Munster's White Oak Ave.
BALTIMORE (WJZ) — A minivan with a father and child inside sinks into a Northeast Baltimore street. It all happened as a result of a water main break along Sheldon Avenue. Neighbors say crews had replaced the break two days ago, but something went wrong. When the car drover over the patch in the road Friday, it all caved in. Neighbors sprang into action to help. “I ran over to him. He was getting out of the van and water up to his knees, and I asked him if he was alright, did he need some help? He said his son was in the back,” said Bernard Williams, neighbor. Hundreds of homes in Winchester were left without water or with low pressure on Sunday after a water main burst. More than 1,000 properties were affected for about four hours in the South Wonston area, Southern Water said. The water main in a field on Lower Stoke Road had "quite a long split along it", a spokeswoman said. She said the problem had since been fixed, and all customers who had been affected were back in supply. ROCHESTER, NY- Water main break closes part of St. Paul St.